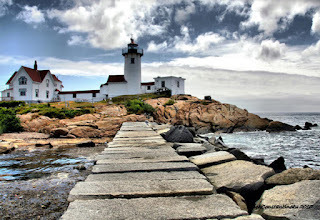 If you love lighthouses, we hope you will visit us where you can explore them to your heart's content. In a previous blog we have written about the Lighthouses of Cape Cod but we don't want to forget about the islands to our south; namely Nantucket and Martha's Vineyard. 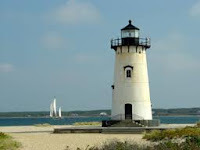 In this blog, we will be sharing information about the lighthouses of Martha's Vineyard. During the 1700s and 1800s lighthouses were paramount for the safe harbor of mariners, especially when navigating the waters approaching an island. The island of Martha's Vineyard is home to five of these guardians of ports. They are all located on the north side of the island overlooking Nantucket and Vineyard Sounds, the entrance to Edgartown Harbor, and Cape Poge. All are easily accessible with the exception of Cape Poge Light. We hope the following information is helpful to you in exploring these beautiful and historic beacons of safety from a bygone era. It is through the efforts of organizations that recognize the importance of maintaining them that we are able to enjoy them today. From the mid 1600s to the mid 1900s, the harbor called "Holmes Hole" was considered one of the most important ports of protection on the Atlantic coast. In 1871 it acquired the name Vineyard Haven and was Martha's Vineyard's busiest port. The harbor is protected by two areas known as East Chop and West Chop with lights in each area. In England, the word "chop" meant the entrance to a channel. The first lighthouse in East Chop was built and privately owned by a sea captain and was funded by local mariners and some who were just passing through. The government bought the little lighthouse in 1878 and built the current structure out of cast iron. It was built on a cliff and stood 79 feet above the ocean. It was fitted with a forth order Fresnel lens that emitted a fixed white light. It was later converted to a flashing red light and then a flashing green light. The lighthouse was originally a reddish-brown color and was called " the Chocolate Lighthouse". It wasn't until 1988 that it was painted white. The lighthouse was automated in 1934 and the original Fresnel lens was replaced by the more modern optic lens in 1984. The lighthouse is open to the public for tours on Sundays right before sunset from mid-June to mid-September. The current brick lighthouse was built in 1838 and replaced the wooden one built in 1817. On October 5th of that year, the fixed white light went into service. In 1846, the tower was enclosed in wood shingles, giving it an octagonal shape. In 1891, this was replaced by a new 45-foot red brick tower. It was painted white in 1896. Twice during the 1800s it was necessary to move the structure back from the edge of the cliff due to erosion. Although the original fourth order Fresnel lens remains in place today, the lighthouse was automated in 1976. Its flashing white light is still visible for 15 miles out to sea. Although it is closed to the public, you can see the lighthouse from West Chop Road and from the ferry entering Vineyard Haven. The mutit-color, clay cliffs of Gay Head on Martha's Vineyard rise 130 feet above the sea. This picturesque location is home to the Gay Head Lighthouse. On November 18, 1799, the wooden lighthouse that was built on a stone base went into service. Its revolving light could be seen for more than 20 miles. In 1844, the tower had to be moved back from the eroding cliffs edge. In the mid 1800s, this light was deemed to be the 9th most important in the United States. In 1855 work began on a new, 51-foot, brick lighthouse that would house a first order Fresnel lens. In 1885 the light was converted to kerosene and in 1952, the Fresnel lens was replaced by an electric beacon. In 1998, Gay Head's name was changed to Aquinnah. Because of erosion the cliffs are closed to the public but the lighthouse is open on weekend evenings from one hour before sunset until a half hour after sunset from mid-June until mid-September. During the late 1700s and early 1800s, Martha's Vineyard had a booming whaling industry. Edgartown was home to more than 100 captains of whaling ships. The homes that they built remain among some of the most beautiful in all of New England. In 1828, the government appropriated money to build a lighthouse that sat off shore on pilings. It had a fixed, white light that could be seen for 14 miles out to sea. In 1830, a wooden bridge was built to provide easier access to the lighthouse. In 1856, a fourth order Fresnel lens replaced the old lamps. After a hurricane destroyed the building in 1938, a cast iron, 45-foot tower was brought to Edgartown from Ipswich, MA and fitted with an automatic, flashing red light. In 1990, a new plastic lens was installed and the light converted to solar power. Over the years, sand has filled the area between the lighthouse and the island until it sits on the beach today. Renovations began in 2007 and this lovely lighthouse is now a popular spot for wedding photos. It is open to the public at specified times from Memorial Day until Columbus Day. http://mvmuseum.org/edgartown.php VTA buses will drop you off on Church Street and it is about a 15 minute walk to the lighthouse. Chappaquiddick is a small island just east of Martha's Vineyard and near Edgartown Harbor. Cape Poge is at the northeast tip of this tiny island. In 1801, a 35-foot, octagonal wooden lighthouse was built there. In 1838, it had to be moved back from the eroding bluff. A new lighthouse with new lights was completed in 1844 and a forth order Fresnel lens was installed. In 1893, a new wooden tower was built 40 feet inland. It was intended to be temporary but still exists today. Because of erosion, It has since been moved inland four times. It has also been refurbished, has had a plastic lens installed, and has been automated. Cape Poge Light still functions as a navigational aid. If you are willing to hike the three and a half miles from Dike Bridge, you can visit the lighthouse. Tours are offered May through November and reservations are required. 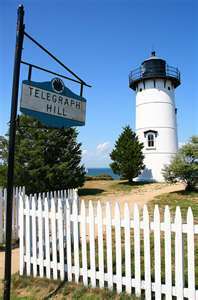 The island of Martha's Vineyard is an easy day-trip from our Cape Cod bed and breakfast inn. Come stay with us and explore these fabulous pieces of history. Imagine it is the 1800s and you are Captain of a whaling ship that has been at sea for 3 years. Your ship is laden with the whale oil from your catch and you are headed back to your family and your home on Cape Cod. You know from past experience that the waters off the Cape are treacherous and that heavy fog can make coming into port extremely hazardous. As you approach land you pray for guidance from above as you scan the horizon for the beacons of light that you know will give you your points of reference and lead you to safety. From Wings Neck in Buzzards Bay to Race Point in Provincetown, Cape Cod is home to 16 lighthouses. These beautiful and historic structures were built to aid mariners with navigation when shipping was vital to life in America. Today, many visitors to Cape Cod go in search of these picturesque symbols of safety to seafarers (try saying that three times). Whether you want to photograph them, tour them, or perhaps spend the night in one of them, we wanted to give you an introduction to each one. Wings Neck extends from Pocasset out into Buzzards Bay. The first lighthouse to sit on this spit of land was built in 1849. In 1857 a fourth order Fresnel lens replaced the multiple lamps and reflectors and in 1928 the lens was replaced and the light changed to a flashing one. In 1934 the light was converted to electricity. A new tower was built to rise 44 feet above the water in the 1890s, and in 1902 a fog bell was added. In 1945 the light was discontinued and in 1947 it was sold to a private party. The grounds are not open to the public but it is available for rent. Wings Neck Lighthouse can be seen from a gate near the lighthouse. From Route 28, take Barlow’s Landing Road onto Wings Neck Road and follow it to the end. One of the most picturesque of the Cape’s lighthouses is the circa 1828 Nobska Light in Woods Hole. It was built to facilitate boat traffic in Vineyard Sound and Buzzards Bay. The present tower was built in 1876 and the light was automated in 1985. The grounds are open to the public but the lighthouse is open for tours only during scheduled times. To reach the lighthouse, take Route 28 in Falmouth to Woods Hole Road and turn onto Church Street and follow it to the lighthouse. 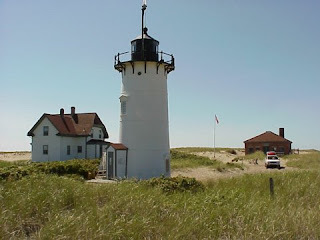 Lewis Bay Light has been know as Hyannis Light and is sometimes referred to as Channel Point Lighthouse. It was built to resemble Brant Point Light on Nantucket. The original light was built in 1849. By 1854, Hyannis had become a major harbor. At that time, the lighthouse was refitted with a 6th order Fresnel lens. When the channel into Lewis Bay was dredged in the early 1900’s, Hyannis Light was no longer needed. In 1929 the lantern room was removed and it was sold as private property. Lewis Bay light is not open to the public but you can see it from North Street and Lewis Bay Road. The best views are from a boat. If you take a ferry from Hyannis Harbor to Nantucket or Martha’s Vineyard, you will pass right by the lighthouse. Bass River Light went into service on April 30, 1855 with a fifth order Fresnel lens that displayed a fixed white light. In 1880, the lighthouse was closed and sold at auction. In August of 1810, after the lighthouse was built on Stage Harbor in Chatham, Bass River light was closed and the property sold at auction. A local mariner appealed to his relative, then President James Garfield, and in July of 1881, Bass River Light was reinstated by executive order. With the building of the Cape Cod Canal, the government deemed the lighthouse unnecessary and on June 15, 1914 the light was extinguished and the Fresnel lens removed. The property was sold at auction and today operates as an inn. Stage Harbor Light in Chatham, built in 1880, is the Cape’s most recent lighthouse. 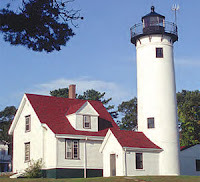 Fishing traffic and thick fog around Chatham prompted the building of this lighthouse, which went into service in 1880. As this is now private property, it is best viewed from Harding’s Beach. Take Route 28 in West Chatham to Barnhill Road and turn on Harding’s Beach Road and follow it to the beach. Chatham Light was established in 1808. 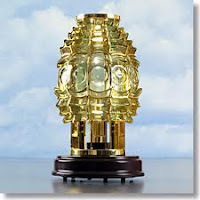 To help mariners distinguish it from Highland Light, it had two fixed white lights. It was fitted with fourth order Fresnel lenses with fixed white lights. In 1857. The current tower was built in 1887 and towers 48 feet into the air. It was electrified in 1939 and was automated in 1982. This is an active lighthouse and is not open to the public except during specified times in which guided tours are provided. From Route 6 (Mid Cape Highway) take exit 11 to Route 137 towards Chatham. Turn left on Old Queen Anne Road and stay on that until you reach Main Street and turn left. From Main Street take a left on School Street and a left on Water Street. Turn right on Silver Leaf Avenue and follow it to the lighthouse. Monomoy Light was the fifth lighthouse to be constructed on the Cape. It was built to help mariners navigate the shifting sands, the rising and falling tides, and the rip currents that flow around what was then Sandy Point. In November of 1823, eight lamps shone a fixed light twenty-five feet above sea level over what is now known as Monomoy Point. The lighthouse was essential for ship traffic along the east coast. It received a Fresnel lens in 1857. After the opening of the Cape Cod Canal and the increase in intensity of the Chatham Light, the need for the light on Monomoy Point was no longer necessary. Day-trips aboard the Monomoy Island Ferry are let by a naturalist and include a visit to the lighthouse if you wish to go. The Three Sisters (3 lighthouses) are located in Eastham. Because of so very many ship wrecks off the coast of Eastham, in 1837 congress appropriated funds to build a lighthouse there. To help mariners tell the difference between Highland Light (with one light) in Truro to the north and Chatham Light (with two towers) to the south, three towers with three lights were erected to mark the dangerous sandbars off the coast of Eastham. They became known as the “Three Sisters” because some thought they resembled three sisters wearing white dresses and black hats. You can determine that for yourselves when you visit. In 1920 the three sisters were replaced by Nauset Light which is still operational today. After the Orleans Rotary on Route 6 east, turn right onto Nauset Road. Follow this to Cable Road and turn left. The Three Sisters are at the end of Cable Road in a clearing on your left. 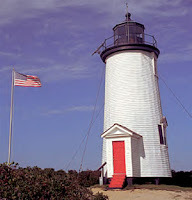 With a history that is tied to the Three Sisters, Nauset Light with is red and white tower is recognizable as the logo for Cape Cod Potato Chips. Traveling east on Route 6, Nauset Road is the third traffic light after the Orleans Rotary. Turn right onto Nauset Road and follow it to Cable Road and turn left. At the end of Cable Road, turn left onto Ocean View Drive and you will see Nauset Light. Highland Light, also known as Cape Cod Light, went into service on November 15, 1797 and was the twelfth lighthouse in the United States and the first on Cape Cod. It was also the first to have a flashing light. 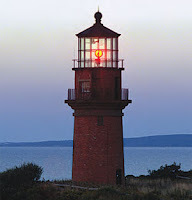 The light was erected because of the increase in maritime traffic around Cape Cod and the treacherous sand bars off the coast or Pamet, which later became Truro. In 1996 the lighthouse was moved back from the cliffs edge due to massive erosion. Guided tours of Highland Light are available from May 1 through late October but the grounds are open year round. Take Route 6 east to Highland Road and turn right. Follow this to the end and turn right on Coast Guard Road. Turn left onto Highland Light Road. Be aware that signs to the lighthouse will say “Cape Cod Light”. Race Point Light went into service on November 5, 1816 and was the Cape’s third lighthouse. It was erected to help mariners with the nightmarish navigation around the end of Cape Cod. It is located on Race Point Beach at the northernmost of Cape Cod in the National Seashore. During the summer months there are regular tours available to visitors and pre-arranged overnight lodging, but you must park in the lot at the Race Point Coast Guard Station and hike the 2 miles to the lighthouse. From Route 6 in Provincetown, take Race Point Road and follow it to the beach. Park in the parking lot and walk towards the Coast Guard Station and follow the trail to the beach and the lighthouse. Woods End Light was built in 1872. It is unmanned and requires a long and treacherous hike to reach the lighthouse. It is about a mile to the breakwater and across the sand to reach the lighthouse. If you choose to visit, bring drinking water, bug spray, and sun screen. You can reach it by walking to the breakwater and across the sand. You might prefer to rent a kayak and paddle out to the light but you will still have a hike through the sand to reach it. You can actually see the lighthouse from a distance at the foot of the breakwater on Commercial Street in Provincetown. Long Point Light is located at the entrance to Provincetown Harbor at the tip end of Cape cod. It can only be accessed on foot or by boat. It sports a green beacon and has horns that are activated by fog. Construction on the lighthouse began in 1826 with the first lamp being lit in 1827. The oil lamp was replaced by a Fresnel lens in 1856. Threatened by erosion, the structure was replaced with a 38-foot brick tower in 1875. Since 1982 the light has been powered by solar panels. It is still an active lighthouse and is maintained by volunteers. Sandy Neck Light stands as a symbol of Barnstable Harbor’s past as an important port for trade and fishing during the early 1800s. The first lighthouse on what was then known as Beach Point was constructed in 1827, and in 1857 it was replaced by a brick tower that was painted white. Today, this area is called Sandy Neck and is a wildlife refuge. All of these historic lighthouses are within easy driving distance of our bed and breakfast. We have had many guests who came to the Cape for a pilgrimage to each of these historic structures. We will be happy to give you a map that will help you locate them when you come for a visit.